Pick up from the hotel. Then climb to "buddha's hair" pagoda and hilltop panorama of Nan. Afterwards visit Nan's famous Wat Phumin as well as Wat Chae Heng, Nan's oldest dragon temple. After lunch drive approx. 1,5 hours across mountains to Mae Jarim area. After a short safety demo raft two hours down the Wa River (suitable for Beginners and skilled Rafters. 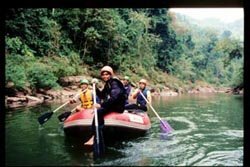 Grades 1-3, during June - September some rapids may upgrade to 4) and enjoy the beautiful jungle of Mae Jarim National Park. Optional activities such as paddling or swimming or just relax on the sand beach. The drive back to Nan for late afternoon arrival. In the morning drive for approx. one hour up the Nan Valley. Visit Nong Bua painted temple and traditional Tai Lue house and weaving. Go on and have lunch at Fish Lake. 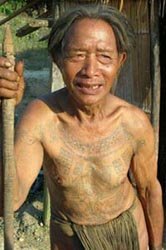 Later arrive at a traditional Thai village of wood stilt houses on the jungle edge. 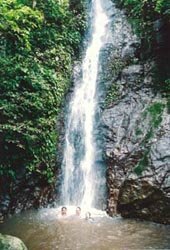 Start hiking for 3-4 hours through virgin evergreen jungle with giant trees to a small waterfall. Opportunity for a refreshing shower or bath. Back in Nan early evening. In the morning drive one hour in to the mountains west of Nan. 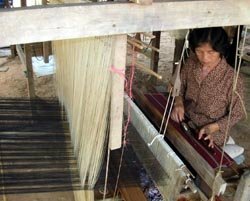 Visit primitive Mlabri Tribe ("Yellow Leaf Spirits") and a Hmong hill tribe village making traditional handicrafts. After lunch have some time to relax. Then drive to the north. At Fish Beach board the boat and enjoy a laid-back two hour trip on the Nan River. Observe the peaceful river life and Tai Yuan fishing village. Stop at the mouth of the Yao River for a swim. You will be back in Nan early evening. Itinerary is flexible. 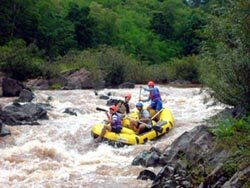 It is possible to left out some parts such as the rafting or trekking and can be replaced with other activities or/and sightseeing. From/to Bangkok most comfortable by Thai Airways flight and takes approx. 1 hour. From/to Chiang Mai by private car/minibus and takes 4-5 hours (can be combined with some sightseeing on route). From/to Denchai (Phrae) railway station by private car/minibus and takes approx. 1,5 hours. All these transfers can be booked with us. Of course it is also possible to travel all these routes by your own with local buses. Accommodation in Nan before and/or after the tour can be arranged at the City Park Hotel (good middle class), which is a bit outside the town or at the Devaraj Hotel (tourist class) in the town centre.